Jennifer Williams has been writing as a freelancer for local newspapers since 1999. Her work now appears on various websites. She did a five-year orthopaedic surgery residency, followed by a one-year sports medicine fellowship and has been a team physician for NCAA Division I universities and high school teams. As a former collegiate athlete, Williams continues competition at the masters level. The number of overweight and obese people in the United States increased from 45.8 percent to 73.9 percent between 1960 and 2007, according to the Centers for Disease Control and Prevention. Between those times, the National Health and Nutrition Examination Survey weighed and measured a large sample of the U.S. population. The CDC uses this data to estimate the prevalence of overweight and obesity. 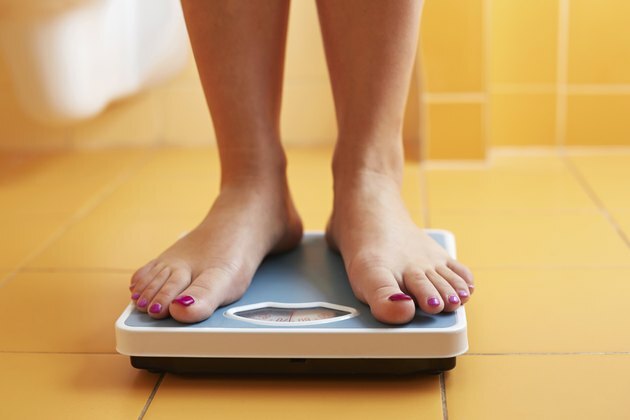 To figure out what you should weigh if you're 5'9" tall, you need to check body-mass index charts, the standard measurement for overweight and obesity in 2013. The CDC and other agencies currently use body mass index (BMI) to determine whether or not a person is overweight at a certain height. The BMI doesn't take into account age or gender. You can compute your BMI with this formula: divide weight in pounds by height in inches squared and multiplying by 703. The easiest way to figure your BMI is to look on a BMI chart. Individuals with a BMI less than 18.5 are underweight. A BMI greater than 25 is considered overweight. Having a BMI of more than 30 classifies you as obese. For a 5 foot 9 inch individual, a normal BMI between 18 and 24.9 means you weigh 125 to 168 lbs. Metropolitan Life Insurance developed the first height and weight tables after reviewing data on height, weight and mortality. The tables listed weigh not only by gender but also by small, medium and large frame size, which was based on elbow breadth. Different weight ranges were listed by gender. In the 1959 tables, a small-framed 5 foot 9 inch woman should weigh between 130 to 140 lbs. and a large-framed woman should weigh 145 to 164 lbs. The ideal weight for a large-framed 5 foot 9 inch male wass 3 lbs. heavier -- 148 to 167 lbs. In addition to height, weight and gender, the U.S. Army and some other organizations allow older individuals to weigh more. The minimum weight for a 5 foot 9 inch female in the military is 128 lbs. The maximum weight increases from 169 lbs. for a 20-year-old and 176 lbs. for a 40-year-old 5 foot 9 inch female. Males must meet the same 128 lb. minimum standard but can weigh a maximum of 186 lbs. at age 40. Epidemiological studies include abdominal fat as a risk factor for heart disease. Females with a waist circumference greater than 35 inches and males with greater than 40-inch waist circumference have an increased incidence of diabetes, heart disease and some cancers. Measures such as BMI can indicate that a muscular individual is overweight. Body fat can be a more accurate measurement. The Army encourages women to maintain body fat under 26 percent and males under 18 percent. The maximum body fat allowed under Army fitness standards is age adjusted from 30 percent for a 20-year-old female to 36 percent for a 40-year-old female. The comparable standards for males are 20 to 26 percent maximum body fat. Maintaining a healthy weight is important since excess body weight has been linked to early death and several medical problems that lower your quality of life. The risks of heart attacks, stroke, diabetes and some cancers are increased in overweight and obese individuals, according to Harvard School of Public Health. Arthritis, apnea, sleep apnea and gallstones are linked to excess weight.